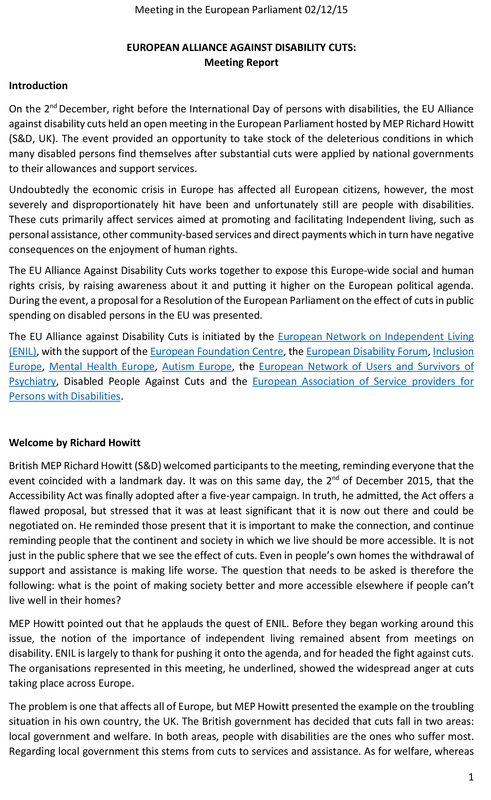 The EU Alliance Against Disability Cuts is a civil society coalition created to counter the disproportionate impact of the crisis on disabled people. The Alliance was initiated by the European Network on Independent Living (ENIL), with the support of Autism-Europe, the European Foundation Centre, the European Disability Forum, Inclusion Europe, Mental Health Europe, the European Network of Users and Survivors of Psychiatry, Disabled People Against Cuts and the European Association of Service providers for Persons with Disabilities. These organisations work together to expose the Europe-wide social and human rights crisis of severe financial cuts being made to services and support for persons with disabilities, by raising awareness about it and putting it higher on the European political agenda.